The Pear Tree Cottage is ideally located north facing the Storms River Peak. Unwind and step off the world for a wee while. Kick off the shoes, sit back and enjoy the views and the sound of trees rustling in the breeze. For Nature lovers, Storms River Village and its surroundings offer abundant birdlife and indigenous flora. For the adventurous, treetop canopy tours, bungy jumping, hiking trails, tubing and much more. For the less energetic, just relax in our verandah and enjoy a good book and some wine. 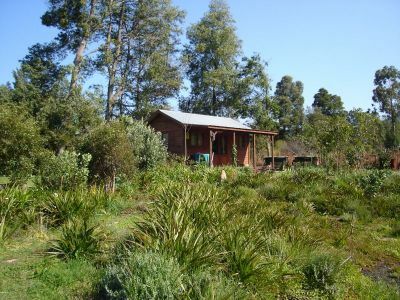 The Pear Tree Cottage is located in Storms River Village, situated off the N2, 65 km east of Plettenberg Bay, and 170 km west of Port Elizabeth. From Plettenberg Bay: From Plett, travel east on the N2 for 65 km and then take the turn–off to your right signposted Storms River Village. From Port Elizabeth: From Port Elizabeth, travel west on the N2, cross over the Storms River Bridge, and about 4km on, take the turn-off to your left signposted Storms River Village. The first right would be Formosa Street. Information of Lombok hotels by location, Senggigi, Kuta Beach, Gili island, Sire beach and Nanggu island, Indonesia. =587" scrolling="no"
Global Bed and Breakfast Links - Find direct links to Bed & Breakfast websites around the world. Hoy habia 1 visitors (7 hits) ¡Aqui en esta página!